Picture the “exact opposite” of fun, escapist summer fare, said Elisabeth Vincentelli in Newsday. That’s what audiences get when they sign up for the new Broadway adaptation of George Orwell’s timeless novel about a totalitarian state. A “powerful but grueling” production whose most violent moments have reportedly caused fainting and vomiting, this 1984 subjects its protagonist to so much noise and physical hardship, “you have to wonder how the magnetic Tom Sturridge can go through this eight times a week.” Sturridge plays Winston Smith, a low-level bureaucrat at the state’s Ministry of Truth who dutifully spreads government lies by day but joins a resistance movement with a secret lover who seems to be like-minded. 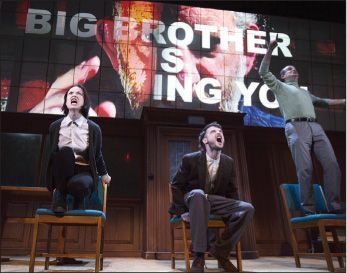 But because Big Brother is always watching—dramatized by large screens providing a simultaneous videocast of the action on stage—no secrets remain safe for long.